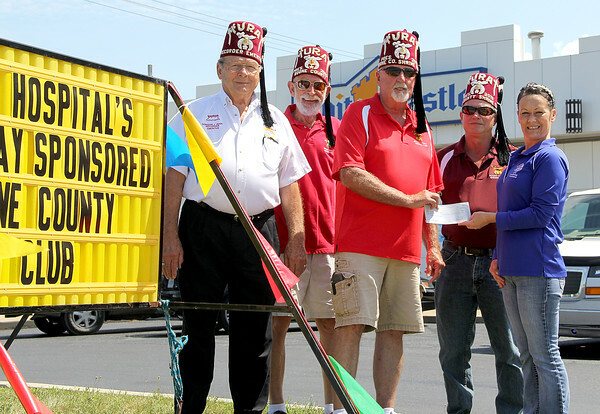 Raising Hope: Boone County Shriners (from left) Recorder Emeritus Gordon Husk, past president Jerry Breedlove, current president Steve Light, past president Dennis Cunningham, present White Castle manager Jessi Willoughby with a check for $500 to donate to the Shriners Hospitals for Children. Boone County Shriners sat outside in near-record heat to deliver literature to those in the drive through and ask for donations. Those giving donations received a coupon for three free White Castle hamburgers. "We've been doing OK and I've seen lots of Illinois plates today," Cunningham said. The Shriners worked in shifts from 11 a.m. to 7 p.m. on Wednesday.